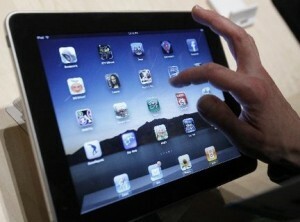 The first thing you notice about the iPad is, well, you don’t really notice it. In many ways, there is just not much here — design wise — to comment on. The bulk of its surface is taken up by a 9.7-inch, 1024 x 768, capacitive, multitouch LED-backlit display surrounded by a glossy black bezel that some will say is too wide but, in practice, is an important design consideration that prevents the touchscreen from being inadvertently activated when handled. There’s only Apple’s signature “home” button to interact with, and the back of the device is a dutifully simple piece of curved aluminum.